When Henri Dutilleux received the hefty Kravis Prize from the New York Philharmonic last year, he generously announced that he would be sharing the money with three other composers. Peter Eötvös was named at that time; last night, at a concert honoring the venerable Frenchman, Anthony Cheung and Franck Krawczyk were revealed as the others. In addition, Sean Shepherd, whom Philharmonic listeners already know from his vibrant CONTACT! commission, These Particular Circumstances, was announced as the Kravis Emerging Composer, and will write a piece for the 2013-14 season. (This prize is to be bestowed every other year, when the main award is not given.) Cheung, a sharp writer as well as composer, said of Dutilleux, "Every time I return to his work, I rediscover what made me want to pursue composition in the first place: music that is brilliantly conceived, heard, and articulated, but filled with mystery, ambiguity, and spirituality." In the video above, Matthias Pintscher conducts Cheung's Fog Mobiles. Another piece of new-music news this week is that Pintscher has been chosen as the next music director of the Ensemble Intercontemporain, succeeding Susanna Mälkki. Pintscher will be one of the three conductors of Gruppen at the Philharmonic, on Friday and Saturday. The New York Philharmonic goes modern this week: tonight is a special concert in tribute to Henri Dutilleux, and the weekend brings two Park Avenue Armory performances centered on Stockhausen's Gruppen. Because, as studies show, people just don't care for crazy atonal music, hundreds of tickets are still available for Gruppen. Oh no, wait, they're sold out.... Notable pieces in the current Opera News: Russell Platt on Hugo Wolf, Fred Cohn talking to Gerald Finley.... The summer calendar for Bargemusic is rich in modern fare: note especially the John Cage mini-festival on July 6, 11, and 18, and the "Here and Now" series.... Tanglewood, celebrating its seventy-fifth anniversary this summer, is streaming seventy-five broadcasts from its archives, with one free offering every day. Berio's Sinfonia, under the direction of the composer, can be heard on June 30.... Not every American orchestra is in disarray: the St. Louis Symphony, a superbly managed group, has concluded a new musicians' contract one year early, with modest salary increases built in.... It's good to see the Guggenheim presenting a concert of Cage, Brown, Scelsi, and Stockhausen in conjunction with its current show of 1950s abstraction. Musicians from ICE, Ne(x)tworks, and Either/Or will be led by Christopher McIntyre, with R. Luke DuBois explicating. Bob Shingleton, in a characteristically trenchant post on the corporate rodomontade surrounding the 2012 Olympics, mentions, in passing, a peculiarity of the Aldeburgh Festival in its present form: Pierre-Laurent Aimard, who just completed his fourth year as artistic director, exhibits a "reluctance to engage" with the music of Benjamin Britten, without whom the Aldeburgh Festival would not exist. Bob adds a link to a short item I wrote about Aimard's Mostly Mozart appearances in 2010. 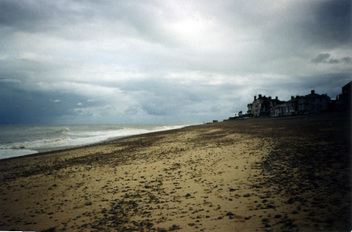 Having not been to Aldeburgh since 2000, I can't pass judgment on the current state of the festival, but the critical consensus gives a generally positive impression: the programming has been infused with the old-guard modernists whom Aimard reveres, while Britten and older classics are still regularly performed. The juxtaposition of different schools of twentieth-century style — from Finzi to Cage — must be bracing. Yet, according to the brochures, not one note of Britten has been executed by the artistic director himself. Isn't this more than a little strange? Aimard has explained in interviews that he is "not a Britten specialist." That's nonsense; if he can play Mozart, Schubert, Bartók, and Stravinsky, he can play Britten. Shouldn't he at least give the music a try, as a sign of respect? What has happened to this pianist's sense of intellectual adventure? Whether or not Aimard takes the plunge, Aldeburgh shan't lack for Britten next year, as a beta version of the Britten 100 site shows. Among the offerings: Peter Grimes on the beach. Update: Bob Shingleton has warm words for a recent multimedia project by Aimard. I have a column on the "new" Brooklyn Philharmonic in this week's issue of The New Yorker (subscribers only). Amy Garapic prepares to ring the closing bell. I spent three strangely soothing hours this morning in the company of the Vexations chapter of Make Music NY, reading a little Hermann Hesse on the side. (Vexations, for anyone who doesn't know, is the Satie piece that, in the tradition established by John Cage, is played 840 times in eighteen-hour sessions. I covered such a marathon for the New York Times in 1993.) This Vexations is emanating from a single vibraphone on the corner of Wall Street and Broad Street, right outside the New York Stock Exchange. In the video above, Matt Evans mans the vibes while Sean Statser keeps track of the repetitions by way of old-school technology. Here, Sean plays while Carson Moody counts. Amy Garapic, who organized the event, has handily finessed various obstacles: the permits are in place, the police are amenable, and, on this very hot day, a Black & Decker mobile AC unit is providing relief. Unfortunately, there were several last-minute cancellations, leaving only six performers to cover the eighteen-hour stretch. I am sure that beverages and snacks would be gratefully received. Hint to visitors: there's a cooling downdraft on the steps to the right of the player. Vexations will continue until midnight; sixteen other marathons are proceeding around the world, as you can see at Vexations Central. (Unfortunately, annoying ads intrude every time you switch from one stream to another.) Make Music NY will get very dense in the late afternoon and early evening: there's Circuit Bending and Humming in Dumbo (6pm-9pm), Alvin Curran's Maritime Rites (Central Park Lake, 5pm), Stockhausen's Musik im Bauch (also Central Park, 7pm), a Philip Glass singalong in Times Square (6:30pm; download the score if you want to join in), Prokofiev's solo Sonata in the many-violin version (Cornelia Street), Frederic Rzewski's Les Moutons de Panurge (Soho), and Wendy Mae Chambers's KUN for sixty-four toy pianos (South Street Seaport, 4:30-8pm), among hundreds of events in dozens of genres. The good news is that there seems to be no chance of rain in New York tomorrow, as Make Music NY takes hold of the city. The bad news is that it's going to be very hot. You might want to get your Vexations in early or late. The Chicago forecast anticipates a high of 80 and a thunderstorm in the morning. Los Angeles is, of course, sunny and warm. In Phoenix AZ, where it will be 110, Vexations is safely indoors. A full list of Vexations performances worldwide can be found here. "Why do we value the network and hardware that deliver music but not the music itself?" The Mighty Wurlitzer at the legendary Castro Theatre, in San Francisco, prepares a sold-out crowd for the movie of the night. When I lived in the Bay Area, in 1990 and 1991, I enjoyed this ritual dozens of times. I enjoyed it a little more last night, when the movie in question was my husband's creation. David Hegarty has been the lead organist at the Castro since 1978. Travels in pursuit of Gayby — I report from Provincetown, Mass. — will make me miss several notable NYC events in coming days. For one, there's the twenty-fifth edition of the Bang on a Can Marathon, on Sunday, kicking off the River to River Festival. The lineup is formidable, culminating in Talujon's rendition of Gérard Grisey's Le Noir de l'étoile. For the following night, So Percussion has announced a Night of Awesome(ness) at LPR. As the founding theoretician of Awesome Music I can only applaud this development. And the Chelsea Music Festival is under way, with a Debussy-Cage emphasis. In a lovely post on the New Yorker website about the Mendelssohn Octet, Russell Platt mentions that that piece is being done in Chelsea on Wednesday, with the soulful young violinist Augustin Hadelich in the lead.... Missy Mazzoli has been announced as the second composer-in-residence at the Opera Company of Philadelphia, joining Lembit Beecher. Mimi Stillman, at NewMusicBox, recounts the company's recent surge. A revised version of Nico Muhly's Dark Sisters is playing there now.... The tenor Nicholas Phan is raising funds for a second album of Britten songs. The first was very fine.... Christian Carey reviews Soundings for a New Piano by the late Ann Southam.... The New York Philharmonic is gearing up for its Park Avenue Armory appearances with a neat series of preview videos. Here, Kyle Zerna and Liang Wang play the opening of Boulez's Rituel in memoriam Bruno Maderna while riding in a cab. And this video, with the assistance of advanced technology, takes us inside the fevered brain of Alan Gilbert. "This hunky string quartet finds the common ground between Mozart and Rihanna." At last! Lincoln Center's White Light Festival has announced its offerings for 2012. William Christie will lead Les Arts Florissants in Charpentier motets; Paul Lewis, placing himself in risky competition with Mitsuko Uchida, will essay the last three sonatas of Schubert; Emanuel Ax tunes in; Heiner Goebbels returns to the city; Cameron Carpenter plays organ works of Bach; Akram Khan and Fabulous Beast head a dance contingent; Mary Chapin Carpenter and the Latvian Radio Choir sing (not together); and Esa-Pekka Salonen and the Philhamonia present the Mahler Ninth. It's especially good to see Joseph Drew and his Analog Arts project given a high-profile gig. I've been following Drew's work for years, often from afar, and last fall I caught his superb presentation of Stockhausen's Cosmic Pulses at the old ISSUE Project Room. (See Seth Colter Walls for a full report.) In all, it looks to be another variegated yet through-composed White Light season. I've added Timothée Picard's monumental Dictionnaire encyclopédique Wagner (Actes Sud) to the small row of books on my desk. Bea is investigating. The New Yorker, June 18, 2012. When composers of the late nineteenth and early twentieth centuries entered the shadow realm of dissonance, they often went in quest of emotional extremes. So it was with Strauss’s “Salome,” Schoenberg’s “Erwartung,” Berg’s “Wozzeck,” and other landmarks of modernism. Yet the progression toward atonality also had a mystical aspect: these uncanny new chords could serve as esoteric icons, emblems of the sacred. Such is the import of certain late works of Liszt, of Scriabin’s music of divine ecstasy, of the occultist pieces that Satie wrote for the Rosicrucian theatre of Joséphin Péladan. Schoenberg’s atonal language found its ultimate purpose in the opening measures of his opera “Moses und Aron,” where hexachords represent God speaking through the burning bush. Twentieth-century composers went on to create a staggering corpus of sacred music, arguably eclipsing the production of the preceding century. Even secular-minded artists like György Ligeti and Morton Feldman wrote works of a spiritual nature, perhaps because their chosen language drew them toward the unsayable. John Adams has described himself as a “secular liberal living in Berkeley, California,” yet he, too, has tilted toward sacred subjects. His opera “The Death of Klinghoffer” juxtaposes Jewish and Islamic theology, and his opera-oratorio “El Niño” gives a contemporary spin to the Nativity story. “Doctor Atomic,” Adams’s opera about the Trinity test, has religious overtones. In part, these themes stem from the preoccupations of the director Peter Sellars, Adams’s longtime collaborator, who has sought to engage with various spiritual traditions in a theatrical vision informed by social activism. All along, though, Adams has shown a mystic bent: the sumptuous tonal chords of early pieces such as “Harmonium” and “Harmonielehre” come across as apparitions or illuminations, to use favored words of Olivier Messiaen, the leading religious composer of the past century. Adams’s latest work, “The Gospel According to the Other Mary,” had its première at the end of May, in Walt Disney Concert Hall, with the Los Angeles Philharmonic under the direction of Gustavo Dudamel. A Passion play in all but name, it is a huge, strange, turbulent creation, brushing against chaos. The modernist tradition of the dark sacred, of the radical sublime, is alive and well; a composer who started out as an acolyte of Boulez, Stockhausen, and Cage has rediscovered his avant-garde roots, and those who prize him as an audience-friendly neo-Romantic are in for some shocks. Although the structure is unwieldy and overloaded—the first performance lasted nearly three hours, intermission included, and a good portion of the audience didn’t stay to the end—it contains some of the strongest, most impassioned music of Adams’s career. Above all, it is a work of daring: a popular, celebrated artist has set aside familiar devices and stepped into the unknown. The libretto of “The Other Mary,” which Sellars devised in consultation with Adams, depicts the last days of Christ from the perspective of the three people devoted to him: Martha, her brother Lazarus, and their sister Mary, who, following an old Catholic tradition, is conflated with Mary Magdalene. Jesus is quoted, but does not sing. Much of the familiar drama of the Crucifixion—the betrayal of Jesus, the trial under Pontius Pilate, the selection of Barabbas, and so on—is absent; instead, passages from the Old and New Testaments, focussing on inward matters of life, death, doubt, and faith, are intermingled with religiously tinged poems by Rosario Castellanos, Rubén Darío, Primo Levi, June Jordan, and, most crucially, the Native American writer Louise Erdrich. (There are four pieces from her 1989 collection, “Baptism of Desire.”) Sellars’s riskiest move is to incorporate writings of the radical Catholic activist Dorothy Day, letting Mary and Martha voice Day’s journals and commentaries in turn: the sisters become fighters for social justice, Mary prone to wild emotion, Martha steadier and steelier. Day is a mighty figure, but her hortatory prose is not easily made into music, and these sections tend to be weaker than the rest. Adams’s orchestra is not large by modern standards: twelve woodwinds, eight brass, and the usual complement of strings. (Beethoven used similar forces for his Ninth Symphony.) There is, however, a major battery of percussion, including a forest of Almglocken, tuned gongs, and tam-tams. The most novel timbres come from a quartet of piano, harp, bass electric guitar, and cimbalom—the hammered dulcimer that Stravinsky memorably employed in “Renard” and “Ragtime.” As in “El Niño,” a trio of countertenors supplies much of the Biblical exposition. In all, it is a fantastically varied sound-world, running the gamut from the neo-medieval harmonies of the high male voices to the end-times funk of the bass guitar, with the twang of the cimbalom lending a gritty exoticism to almost every page of the score. The work begins in spectacularly abrupt fashion, with slashing chords and the words “The next day in the city jail we were searched for drugs.” (This is from Day’s recollection of a humiliating imprisonment that she experienced in her radical youth.) The chorus interjects an apocalyptic prophecy from Isaiah—“Howl ye; for the day of the Lord is at hand”—while the horns bellow in dissonant proximity to each other, and the winds and strings scurry underneath. The two female leads are introduced, and a Spanish-language chorus sways, buoyantly, in a minor mode. It is in the third scene, devoted to the raising of Lazarus, that “The Other Mary” is overtaken by a divine weirdness. Rapid arpeggios accumulate into a Ligeti-like fog, suggesting the wafting away of a life; woodwind glissandos hint at decomposition (“Lord, by this time he stinketh”); and a moaning, muttering, and shouting chorus evokes fear and awe before the awakening of the dead. Few musical works have conveyed so vividly the fundamental spookiness of the idea of resurrection. Act II opens with a ferocious Erdrich chorus (“Orozco’s Christ”) and another momentum-slowing Dorothy Day disquisition, recounting her arrest during a 1973 United Farm Workers action in Salinas Valley. This is the final lull: from the first bars of the Golgotha scene to the end, “The Other Mary” moves on a very high imaginative plane. Low gongs, bass guitar, and the soft screech of a bowed tam-tam create a cavernous aural space. Bassoons, cellos, and basses crawl through the lower register. The ranting chorus returns, now directed to be “yelling, mocking, abusive,” with a crowd of unhinged mourners ensuing. A klezmerish clarinet wails; a police whistle blows in the wake of an extended scream of lamentation. When the Virgin Mary is described as beholding her Son on the Cross, those who know “El Niño” will hear a heartbreaking echo of that work’s Mary music. Oboes and clarinets keen through a lament by Mary Magdalene, based on Erdrich’s poem “The Savior.” Ashen choirs of wind and brass mark the three days in the tomb. It is all terrifyingly beautiful. Messiaen haunts several pages of the score, but Adams lacks his predecessor’s unquestioning belief. The Resurrection elicits no major-key blaze of glory; instead, the shadows of Golgotha simply steal away, yielding to a tableau of awakening nature, of instrumental rustling and chirping mixed with recorded sounds of frogs. The chorus, reverting to childlike innocence, delivers a crisply syncopated setting of Erdrich’s “The Sacraments” (“It is spring. The tiny frogs pull / their strange new bodies out / of the suckholes . . .”). A roar of percussion signals the earthquake that opens Christ’s tomb; then that noise, too, subsides. Mary Magdalene, near the tomb, gazes at a man whom she takes to be a gardener. “Mary,” the figure says, in the countertenors’ narration. The orchestra shimmers, shakes, and rumbles all around, with the cimbalom trilling at the center of the sound. Then it vanishes into silence. The Los Angeles Philharmonic began rehearsing “The Other Mary” immediately after the last of a series of staged performances of “Don Giovanni”—a coolly stylized production under the direction of Christopher Alden, with arresting crumpled-paper sets by Frank Gehry. The orchestra had not been expecting Adams to deliver quite so vast a piece, and rehearsal time was limited. Under the circumstances, and, indeed, by any standard, they played magnificently; the brass section, in particular, deserves a medal for courage under fire. The vocal leads—Kelley O’Connor, as Mary; Tamara Mumford, as Martha; and Russell Thomas, as Lazarus—gave red-blooded life to elusive characters. Daniel Bubeck, Brian Cummings, and Nathan Medley, the countertenors, sang with purity and intensity. The Los Angeles Master Chorale threw itself vehemently, even dementedly, into the proceedings. Dudamel, who apparently knew the score inside out, led with a clear, sure hand. The L.A. Phil demonstrated once again why it is the most creative, and, therefore, the best, orchestra in America. “The Other Mary” has yet to reach its final form: when Sellars presents a full staging of the piece—first at Disney, next March, and then at Lincoln Center, later that month—it will undoubtedly change complexion. Also, because Adams wrote more quickly than he might have wished, beginning the score eighteen months ago and finishing it just three weeks before the première, he may reconsider matters large and small. Some cuts should only heighten the impact of what is already an immensely potent work, one that may prove pivotal in the composer’s output. At the age of sixty-five, Adams seems to be entering a new phase, revisiting the danger zones of twentieth-century style, and the first results are astonishing. From Semyon Aranovich and Alexander Sokurov's documentary film Sonata for Viola. The Cage just doesn't stop around here. Tonight at Greenwich House Music School the esteemed pianist Taka Kigawa plays various pieces by the master, including some of the Études Australes. On Saturday night, the Darmstadt series presents an all-Cage program at ISSUE Project Room, with rare performances of Hymns and Variations and Twenty-three alongside the familiar String Quartet in Four Parts. ISSUE's programming is very rich this month, with Philip Glass-led fundraisers June 13-15 and Stockhausen on Make Music day, June 21. Note also that there will be a Satie-Cage Vexations marathon that day — one of several around the world.... Michael Mizrahi appears on behalf of his acclaimed new record The Bright Motion at LPR on June 12; the viola's Nadia Sirota is also in the house.... Speaking of Sirota — I'm not sure if there's a relation here [update: in fact, there is none] — Raphael Mostel tells of bringing Beate Sirota Gordon to the recent Marc-André Hamelin performance of the Busoni concerto; her father, Leo Sirota, gave the Viennese premiere, with Busoni conducting.... The Brooklyn Philharmonic finishes up a remarkable season in Bed-Stuy on Saturday, with a program of Beethoven, Andrew Norman, Lena Horne standards, and Yasiin Bey (aka Mos Def). The same night, David Robertson leads the second of two New York Philharmonic CONTACT! concerts, featuring Boulez, Michael Jarrell, and an Elliott Carter world premiere.... Wordless Music, a crucial addition to the NYC scene since 2006, comes to Millennium Park in Chicago this summer; the July 5 show, with the aforementioned Norman, looks particularly good.... Jacaranda in LA announces its 2012-13 season, with a Cage and Britten focus. Season after season, the twentieth century comes to life in Jacaranda's programs: only here can you get Vexations and Curlew River.... Here's a fun smackdown between Tony Scott and David Carr, both of the New York Times, on the subject of critical vs. popular taste. If I could be forgiven for straying off topic, I'd like to trumpet briefly a series of forthcoming events involving Gayby, the acclaimed feature-film debut by my husband, Jonathan Lisecki. (It has won, among other prizes, the audience award for Best Feature and the jury award for Best Acting Ensemble at the Ashland Independent Film Festival. Jonathan received his prizes from none other than the Twin Peaks Log Lady.) The movie is playing now at the Seattle International Film Festival. It shows in Hartford CT on June 9. On June 15 and 16 it will appear at the Provincetown Film Fest. That same day, the 16th, it will play both at Frameline in San Francisco — the great Castro Theatre — and at the LA Film Fest, where it will have a second screening on June 21. And on June 22 it will be featured at BAMcinemaFest, with a showing to follow in NYC's Rooftop series on June 23. "Hilariously bitchy but sweet," says the Village Voice.